Are you compliant, secure, or both? Leveraging data protection and security best practices is crucial to protect your company’s Digital Life. Veeam offers businesses and end users the confidence that their Digital Life will be Always-On and uninterrupted. Learn unique solutions for ransomware resilience and efficient data recovery and ensure you have the right plans in place. Since when did one-word sentences like that become common? Is it our fascination with smartphones, nay, our addiction to them, even our seeming evolution towards becoming man-machine cyborg-like entities where smartphone chips will be implanted inside the heads of newborn infants, that has led us to these sweeping changes in how we communicate with each other? Enjoy this week's newsletter which is just a mix of different stuff since I'm still recovering from a bad cold that knocked me down for several days. You can read about why I caught the cold in this coming Wednesday's issue of FitITproNews when it arrives in your inbox. A few years ago one of my customers wanted to add redundancy to his infrastructure running on VMWare on a Netapp storage. He bought a second storage and wanted to mirror his existing storage to the new one. Unfortunately he mirrored the new empty storage to the production storage, thus erasing his whole infrastructure with one mouse click. It took them weeks to rebuild the whole system and search through old tape storage to recover at least some data. And now on to the main topic of this week's newsletter which is…this and that. In the opening scene of the movie Three Days of the Condor starring Robert Redford and Faye Dunaway you can hear the distinctive sound of a line printer as it prints out stuff in a clandestine CIA office while those who work in the office are killed off one by one by an assassin dressed as a mail delivery person. When was the last time you heard the sound of a line printer or it's smaller cousin the dot matrix printer? Just the other day at the Avis rent a car counter… Go figure. Ah, the memories your newsletter brings this week. My first computer class ever was Fortran in college (WATFIV specifically). Some of my introductory computer classes still used cards and we had the same wait you described for a print out - that would eventually be left in bins labeled A-Z for your last name initial. One night everyone from my class was still at the computer center trying to get a project done. It was due at class the next day. It required that we use a section of code provided by the professor and no one could get it to work. While comparing notes we all started to come to the conclusion that the professor's code was flawed to the point where we were not even sure what would be a fix. It was getting very late. So what could we do? The university billed out for any job runs on the computer based on time used. Every class was given an account and funny money was added to that account to allow students to run jobs. When it got low, the professor would need to add more funny money. If it ran out, nobody using that class account ID could run a job. Wanting to sleep sometime, we decided to write some very inefficient code and drained the account of money. With the account dry, nobody could run any more jobs. So we all went home to sleep. The next day the professor realized his coding error and apologized for that and for letting the account run dry. He gave us a couple more days to turn in the project. Ah yes, WATFIV! What a great language to code in at the time, especially for someone like me who was studying physics. Thanks for sharing! In Australia there are still payphones but, like in the US, they are very much a threatened species. Some years ago I was staying at a little country town, population about 100. The only retail business in town is the pub. Mobile signal was very poor as it had to come from the towers in the next town. I was advised that the best place to get signal, indeed the only place, was about 100 metres from the hotel on top of the hill. Wanna have a guess what landmark is there? A public phone box. I laughed out loud at the irony. 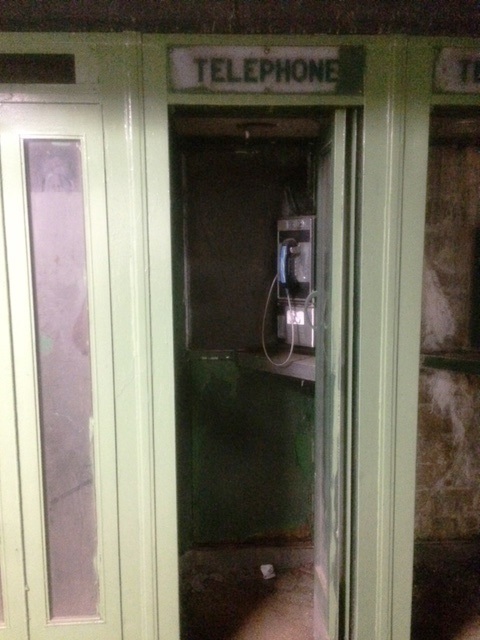 I came across this row of old phone booths under the 79th St. Boat Basin Cafe, right next to the Hudson River bike lane in Manhattan's Upper West Side. IIRC there are five booths, at least two of which have working phones. Sugarland, Texas outside a convenience store on old Federal Highway Alternate 90 back in the late seventies. Used to be 10 cents for local calls. My mother (84 years) tells a story of when she was a girl. She was told to use the pay phone to call home before walking from a late session at her public school in Minneapolis, Minnesota. She was not connecting or constantly got a busy signal. What she did not know is that the phone would refund your nickle if your call didn't go through. Her father drove her back to the phone later that evening to find a Dollar's worth of change left. Very lucky, indeed! Hong Kong's richest man, Li Ka-shing, recently announced his retirement as chairman of CK Hutchison Holdings. Where did the pumping gesture used with this expression originate? Two possibilities/influences to the ka-ching sound and arm action. Working an old-time cash register, winding the side crank to register the purchase and open the drawer. Arm action and sound when the drawer opens. The arm action from old slot machines, pulling the level and the sound of the coins hitting the tray. Thanks for you newsletters. Long-time reader/perpetual learner. This is where I first heard the phase ka-ching or ca-ching and the pumping gesture. In the southern USA, Snapps was known as Rally's. I haven't seen a Snapps or a Rally's in years. Fact: Tim Hortons has now slipped from 4th to 50th place in a survey of top corporate brands among consumers. Question: I rarely drink coffee from Tim Hortons as I find it tastes weird. What do you think they put in it that gives it its unique flavor? P.S. I have my own theories but I'd rather hear from you readers first. Live demos – Veeam integration with IBM, EMC, Nimble, Pure storages – supercharge your storage platform. A nasty banking Trojan dubbed Metamorfo uses "malspam" to exploit legitimate Windows components to make convincing phishing emails. Here's an easy way to create and clone a simple, generic Windows virtual machine without the hassle of creating a VM template or traditional deployment image. Whether IT is upgrading an existing VDI deployment or implementing VDI, there are a series of tests it should run, including making sure users can access their virtual desktops. Read more here. Knox 3.0 brings a new architecture, unifying Knox and Android enterprise MDM APIs. Find out more here. You may have seen amazing pool trick shots, but you have never seen anything like this! Take one chocolate bar, cut it into pieces and shift them around until it's the same size ... but with an extra piece!